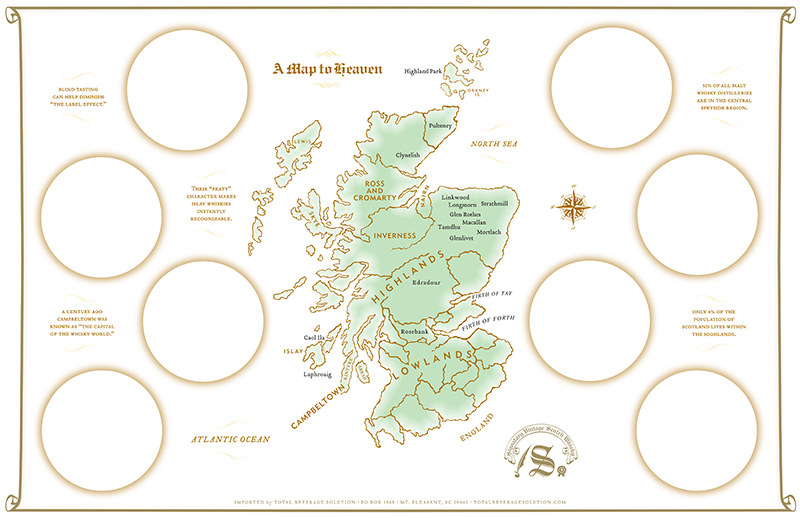 You shouldn’t have to break the bank to host an enjoyable scotch tasting gathering, but a few bottles from different appellations (Highlands, Lowlands, Speyside and Islay) will help add to the educational experience and allow your guests to recognize the differences in characteristic traits for each region. Signatory is perfect for this very reason as it is offered from multiple regions using different methods all under the same brand. Just remember that it isn’t true scotch unless it is distilled in Scotland. If you didn’t already know, Scotch, much like wine and other spirits, has dedicated glasses crafted specifically to offer the best consumption experience possible. Scotch glasses are tulip-shaped and specifically designed to concentrate the aroma before it reaches the top. This also keeps the aromas from escaping or diluting when you put your nose to the glass. Adding tiny details can help add to the experience and much of how Scotch is appreciated stems from its aroma. Adding approx. 20% spring or mineral water can help to accentuate the bouquet of a scotch, making it easier to define the intended aromas. Having simple foods on hand is also a pleasant treat for guests to experience the ways that certain food mix with each of the varieties of Scotch that you are serving. A few quick ideas include cheese, chocolate, roasted meats and fruit (try to avoid overly citrusy fruit and heavy sauces, however, as they can overpower the Scotch). Unsalted crackers also help to clean your palette before trying a new variety of Scotch.